Margaret Bohls makes hand-built pottery and vessel forms that she shows and sells nationally. She received her BFA from Rhode Island School of Design in 1989, and her MFA from Louisiana State University in 1995. She has been teaching ceramics at the college level for over twenty years. She is currently Associate Professor of Art at the University of Nebraska – Lincoln. She previously taught at the University of Minnesota and has been a visiting faculty member at Ohio University, Penn State University and NSCAD University in Halifax. She has given lectures and workshops at universities and art centers across the US. Margaret’s work is included in several public and private art collections and has been featured in periodicals including Ceramics Monthly and Studio Potter magazine. This new body of work was begun in 2013 and consists of what I consider to be sculptural representations of utilitarian forms arranged on, and framed by, large stoneware trays. 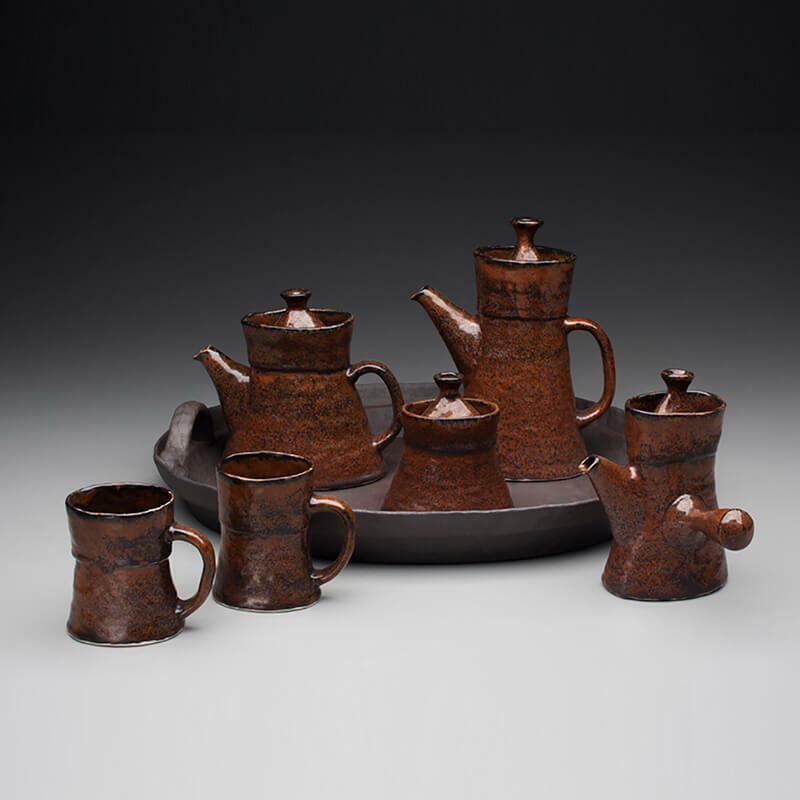 The forms are largely based on European, Modernist era silver tea, coffee, and chocolate sets. My interest is in the abstraction and repetition of forms and visual motifs, and in the “still life” like arrangement of these forms. However, I am also interested in the “loaded” nature of these forms. They carry references to the classism of the societies in which these forms were developed to signify status and worldliness, as the drinking of tea, coffee and chocolate developed from trade with and colonization of Asia and the new world. The materials from which they were made, porcelain and silver, were also intended to convey the status their owners. Historically these forms were elaborately ornamented and adorned with form language and imagery that reinforced these ideas, although most of these signifiers have been deliberately erased in their modern manifestations, as the rituals of their use have become less practiced. My work, like its Modern inspirations, is quite formalist and the actual function of this ware is vestigial. Unlike my historical inspirations, in my “modernist” pieces I place a deliberate emphasis on process and substance. The forms are pinched up from moist clay and the glazes are chosen and applied to emphasize their substance and character. The forms are left unrefined and retain the repetitive marks of the pinching process. The glazes are thick and have rich visual texture. The dark, course stoneware trays are left unglazed. These sets are oversized, to emphasize their weight and physical presence.